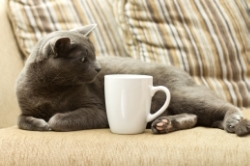 The picture pretty much sums me up for today--trying to decide between a nap and having another mug of caffeine. It has been an exhausting week, but in the absolute best way. My head still spinning with all of the wonderful things that have happened. I pressed 'send' on my revisions for my next Christmas story, due out in October. But alas it has no name yet. I'll let you know as soon as it does. And then Monday the SAFE IN THE TYCOON'S ARMS blog tour kicked off and the people have been so amazingly supportive. Thank you everybody who took time to check out some of my stops and chat with me. And if you haven't had a chance yet, don't worry. The blog tour continues until March 21st. And there are some cool prizes. :-) You can check it all out on my Calendar page. I started at Book Mama Blog where I talked about "Finding That Special Someone". At Fresh Fiction, I'm talking about "Spreading My Wings". Over at Just Contemporary Romance I'm revealing some of the "Behind The Scenes" research I did while writing SAFE IN THE TYCOON'S ARMS. And I stopped by Tawny Weber's blog to do a fun Quick Six.